LabStart is a blockchain-based investment platform that aims at reassessing the way innovations are funded. 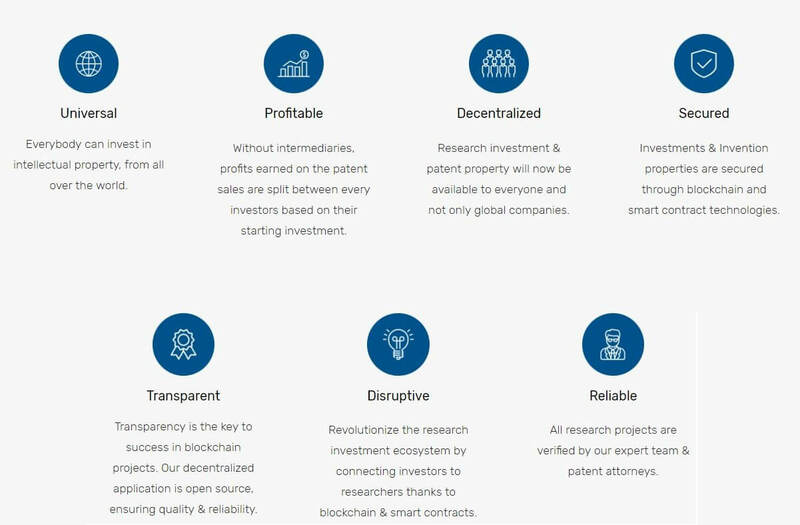 Our goal is to allow anyone to invest directly in the innovation projects presented on the platform – thanks to LabCoin – and to allow investors to own a share of the project’s resulting patents. Thus, it offers a secure and decentralized alternative to the traditional innovation investment ecosystem. Three main issues can be pointed out in the current system: the lack of funding for innovators, the difficult processes used to access funds and the lack of safe places for individuals to invest in innovation. LabStart aims at bridging the gap between people and the potential innovative solutions, in order to answer our society’s growing challenges. The blockchain and smart contracts technologies address those issues by providing an accessible, distributed and controlled environment. Once research and development results in a patent, investors will hold a certain amount of intellectual property, calculated based on the quantity of funds invested. As such, they will have decisional power over the outcome of the innovation – sale of the patent, distribution of licences, etc. – according to the relevant legal environment. The LabStart project was initiated as a means for everyone, especially individuals, to invest in the innovation sector with a secure, accessible and open platform based on the Ethereum blockchain. Everybody will have the possibility to easily support innovative projects and directly benefit from them. Apart from participating in thrilling new projects and helping shape the future, investors will hold a certain number of shares in the resultant intellectual property. As for the innovators, they will be able to bypass the innovation fundraising ecosystem that currently narrows their possibilities. In fact, innovation projects with patents filing can be carried out by a wide variety of entities : start-ups, small to large companies, independent laboratories and others. Before delving any further into our project, please note that none of this would have been possible without the infrastructure created by the Ethereum Foundation. Special thanks to Jean-François Boulicaut, Michel Colombo and Johann Stan for their precious advice and expertise. The intellectual property resulting from research is protected by one or more patents, filed with the competent bodies of each country. To issue a worldwide protected patent, it is possible to fill an application under the PCT (Patent Cooperation Treaty), which has the effect of a ‘regular national filing’ in each of the PCT contracting states. The ownership of a patent can be economically translated in three ways : commercial exploitation, the sale of the patent, and the sale of user licenses . In 2007, economists estimated that intellectual property in the US exceeded $5 trillion, 45% of U.S. gross domestic product. 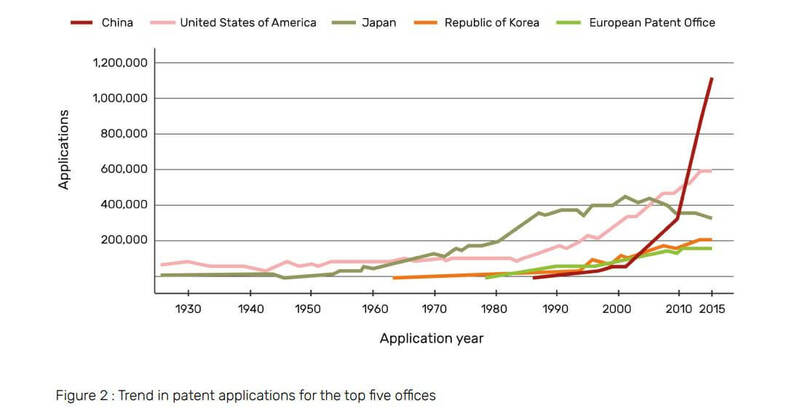 Successful patents generate approximately $ 180 billion in licensing each year. The average value of a patent is $ 400,000 on the brokerage market. It goes up to $ 1 million per patent on OTC markets, as shown by transactions between Google, Motorola, Apple, Facebook and valuations of listed funds. 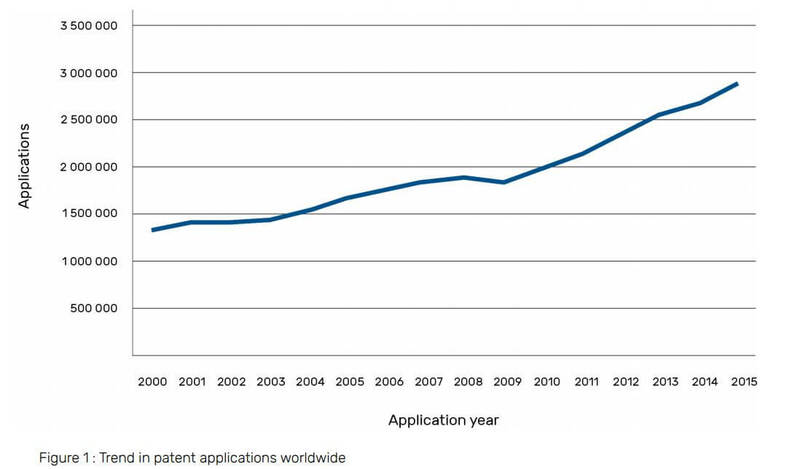 Every year 750 patent brokers have an acquisition capacity of $ 8 billion. In 2015, according to WIPO Statistics Database (October 2016), 2.9 million patents were filed. Innovation refers to this humankind specific capacity to create new solutions, tools and more efficient processes to improve the living conditions of the whole society. Indeed, our world today would be by far different if the industrial revolution, for instance, had not taken place, if Thomas Edison had not invented the electric bulb or if the Wright brothers had not contributed to what became later modern aviation. In the light of these innovations that had a direct impact on our contemporary lives and our way to see our future, we can indeed say that the world of tomorrow is to be built on the innovation projects created today. Today, innovation is at the heart of our societies. Indeed, the major technological innovations of these last years combined with the economic current environment demanding companies to be more and more competitive are meeting the ideal requirements for the innovative ecosystem to be fully operational. Besides, some major society challenges such as ecology, overcrowding, or else decentralization appeal to the capacity of our societies to find innovative solutions that will help solve these problems in the years to come. The Blockchain is a perfect example of the importance of this innovative process combining both the maturation of computing technologies and the need to bring alternative solutions to banks, following abuses linked to the currency centralization that notably led to the subprime crisis in 2007–2008. The Blockchain is thus an example of an innovative alternate model to revolutionize our considering economic models. Nowadays, it is very difficult for an individual to get directly involved in an innovative project. Indeed, the available solutions for an individual are either to put one’s money in a bank that will invest for you in the company innovative projects they will have chosen on their own or to be part of a group of investors (business angel type) who are incubators’ partners or else who directly know startups to allow them investing in their project. Yet, this second solution requires a very important financial contribution. Thus, the current innovation ecosystem is in fact really closed to a large part of the population who can only join via indirect and centralized means, such as investment banks. Considering the great impact of innovation in our life now and in the future, we think that anyone must have the opportunity to join the process, and all levels/steps. Everybody should thus be able to join the creative phase of an innovative project by bringing suggestions or their financial support, but also the project follow-up by confirming that it follows the proposed direction. Furthermore, once the technology or the concept developed, they should be able to determine the future of this technology by deciding, for example, on the way it should be used. LabStart’s vision is to make investing in research accessible for people all over the world, allowing them to own intellectual property. On the one hand, LabStart allows companies and organizations to present their innovation projects on a dedicated platform. The aim is to streamline and simplify access to investment for players while eliminating many intermediaries. LabStart platform is a kind of crowdfunding solution for innovation projects. In the other hand, LabStart creates investment opportunities for people, allowing them to invest in research projects with no minimum requirements. Investors collaboratively own the property of the inventions through patents. Detaining parts of patents allow them to vote economical and ethic decisions on the use of the patent they backed, so as to maximise their return on investment. 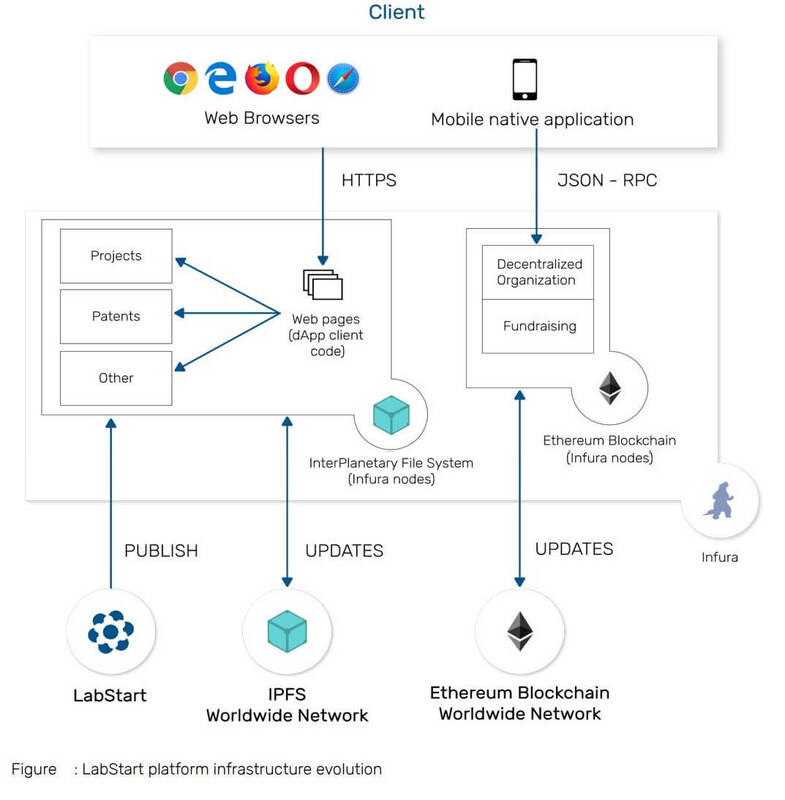 LabStart’s decentralized investment platform is a third party service where research projects in need of investments are displayed. Investors owning LabCoins can choose projects they believe in and back them up using LabCoin. LabCoin will be first issued during the ICO and then tradable on market exchanges. Intellectual property sharing is made possible thanks to the blockchain and smart contracts technologies. Project monitoring, security and transparency of investments and the situation of each investor about a project is also guaranteed by using various cryptocurrency technologies. Finally, a legal department is in charge of validating all the legal aspects with the competent administrations. DO (Decentralized Organisation) & Fundraising: The LabStart platform is divided into two modules during its technical set up. Legal department: Management of the patents’ publication and abidance to international law. Third party department: The TDP is the internal LabStart entity that links the DO with the external world. 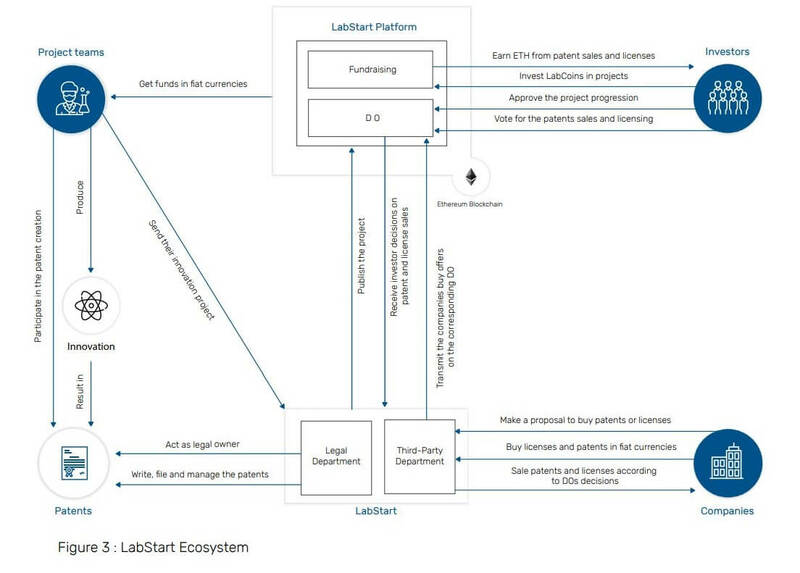 Investors, project teams, companies : The interactions between those three entities with the LabStart ecosystem are detailed in the ‘LabStart’ platform section.